One Queensridge Place is the first vertical custom condominium home community in the northwest Las Vegas valley. The distinctive architecture of One Queensridge Place is reflective of the Art Nouveau Movement that blossomed at the turn of the Twentieth Century. Intricate design and detail along with the use of great proportions and sense of space were inspired by classic European buildings and define this distinguished style. This premier community offers spectacularly finished amenities and is in close proximity to fabulous dining, great shopping, live entertainment, spectacular golf, hotels and gaming. One Queensridge Place's prices range from $1.2 million for the condos to $4 million for the Penthouses. Each unit will have its own private terrace, courtyard, or garden. Penthouses will have exclusive elevator accessibility. 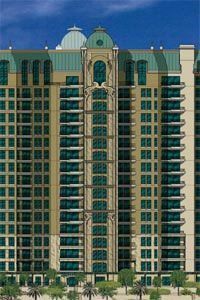 There are a total of 385 condominiums with 43 floor plans available, with the smallest unit at 2000 square feet. One Queensridge Place offers luxurious amenities to bring serenity and joy to all of its buyers. These include a fitness center, indoor lap pool, a distinctive wine cellar with a wine tasting room, exclusive dining room, theater room, billiards, sun terrace with outdoor kitchen and barbecue area, and an outdoor recreation pool with Jacuzzi.